Posted by Madison Kettlewell on November 6, 2018 in News, Top Stories. Ferris State University’s Department of Public Safety recently sent out an email to students informing them of a parking policy change. The new policy stated that starting Monday, Oct. 29, vehicles with six or more unpaid tickets found on campus would be towed at the owner’s expense. Previously, the Department of Public Safety would immobilize vehicles located on campus that had accumulated six or more unpaid tickets. The email sent to students stated that before the towing company releases a vehicle that has been impounded, students will have to pay off all their tickets. 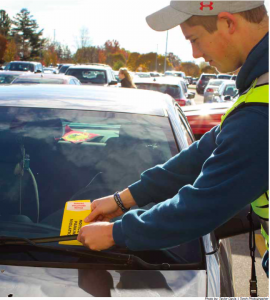 Since the majority of parking tickets at Ferris are $20, an accumulation of six or more tickets could hurt students financially. Students were reminded in the email that unpaid tickets would not be taken care of on their student accounts. Instead, students must pay off their tickets in person at DPS or online through their website. King said that students might struggle with the policy since some students let tickets go merely because they don’t have the money.